I visited Iceland for the first time last year. The landscape is relatively new in Earth terms, still bubbling away with molten lava forming new land and the ground heaving and breathing in various directions. Springs, geysers and craters give the space a body-like appearance. Black, pale sulphur yellow, iron brown, grey, white and moss green are the dominant colours. I found myself thinking of the body of the landscape in terms of gender. Orifices were neither male nor female, but spoke of both – hermaphrodite protrusions and holes that occasionally ejected water or fire. This is the kind of terrain that I thought about when I saw Vézelay’s Curves and Circles. Officially the painting is oil on canvas, but it is clear when you are with it that there is at least one other material mixed into the paint that has the appearance of sand. The surface shifts between dry sandy areas and lacquered liquid-like patches. Within the pale, aerated picture plane there are spherical forms floating in space: planets, atoms, sink holes. Vézelay’s paintings offer or seem to look for and towards a future of order and clarity, where liberal freedom might also exist. This is not a painting of chaos, history or hopelessness. Instead you are left with a sense that life continues, that in a derelict and sulphuric landscape the beginnings of a new way of life are formed. 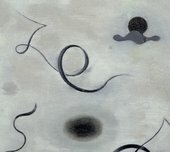 Curves and Circles was bequeathed to Tate in 1985 and is included in a display of Paule Vézelay’s work at Tate Britain until 5 November. Celia Hempton is an artist living and working in London.